Jharkhand High Court Admit Card 2018: The Judicial Department of Jharkhand has released Personal Assistant (PA) & Stenographer Exam admit card scheduled to be held in Aug 2018. Aspirants, who have applied for the 181 vacancies of PA and Steno, can now download Jharkhand High Court Admit Card 2018 from this web page. The Judicial Department of Jharkhand is going to conduct recruitment to hire 181 Posts of Stenographer English (Civil & Family Courts) & Personal Assistant (PA) through Stenography & Typing Test Followed by personality Test And then Viva/Voce Test. The first recruitment process is Stenography & Typing Test commencing on 20th & 21st of August, 2018. The high court of Jharkhand has now released the Jharkhand HC Stenographer & Personal Asst. Hall Ticket/Call Letter 2018 for the Stenography Test. Individuals are strongly advised to download the Jharkhand High Court Admit Card as early as possible to avoid the last time rush. The very first step is to login to the official web page of jharkhandhighcourt.nic.in to get JHC admit card. Further hit on the “Recruitment” tab present on the left side of the web page. Now search for the link “Admit Card for the Recruitment of Personal Assistant (Adv. No. 01/Accts./2018) and English Stenographers (Adv. No. 01/Admn.Misc./2018)” and hit on it. 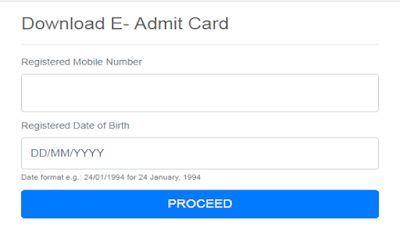 Now enter the registered mobile number and date of birth and hit on “Proceed” button. Within few seconds your JHC Steno & PA Typing Test Exam Date 2018 will appear on your digital screen. Download the Jharkhand High Court PA Admit Card and also take the hard copy of the same for future use. Candidates who are going to appear in the Stenography & Typing Test Exam, are advised to download the JHC Personal Assistant Typing Test Admit Card 2018 as the Court will not allow any of the individual to enter the examination venue without the admit card. The Jharkhand Court will not send Admit card to anyone. Only candidates have to download it from the official website. So, download the High Court of Jharkhand Admit Card from this web page and keep it safe for the examination. To more know about the Jharkhand High Court and Jharkhand High Court Admit Card 2018, visit the official website of the Court. You can also like our web page to get the latest notifications about all new Recruitment Updates. Also write your query related to above provided information in the below provided comment box.